Gr 5 Up –This comprehensive guide recognizes that there is no “typical” family structure and emphasizes that family is not just about bloodlines. Resler, T.J. National Geographic Kids Guide to Genealogy. 160p. further reading. glossary. index. photos. websites. National Geographic. Apr. 2018. pap. $14.99. ISBN 9781426329838. Gr 5 Up –This comprehensive guide recognizes that there is no “typical” family structure and emphasizes that family is not just about bloodlines. With a theme of the United States as an immigrant nation, this title suggests genealogists are detectives, gathering, evaluating, and documenting evidence. It offers many useful examples, including how to cite evidence, and points out the tools needed. Resler offers suggestions on how to tackle research difficulties, such as geographical boundary changes. Readers will also learn the value of original and derivative sources. There is even a section on deep ancestry. The colorful layout includes plenty of fun facts, bulleted clues, and examples of research roadblocks, with solutions, case files, and activities. This volume expertly identifies libraries, historical societies, and other organizations of value to genealogists. It also establishes the crucial role of librarians and archivists and stresses the importance of how one’s own life shapes history. 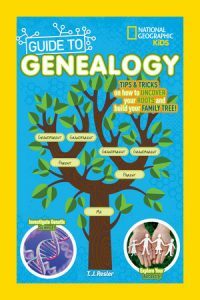 VERDICT Highly recommended for young people interested in genealogy.–Lisa Gieskes, Richland County Public Library, Columbia, SC This review was published in the School Library Journal March 2018 issue.